Ruth Wilson stars in Mrs Wilson. Award-winning actress Ruth Wilson leads an all-British cast in Mrs Wilson, a new original three-part drama for BBC One based on the life of her own grandmother. It’s 1963, and Alison Wilson (Ruth Wilson) returns home to find husband Alexander (Iain Glen) dead. Blinded by grief, Alison is bewildered when a woman unexpectedly arrives at the door, claiming to be Alec’s ‘real wife’ Gladys (Elizabeth Rider). Alison embarks on a mission to discover who her husband really was. But, by dissecting their wartime romance whilst working for the secret service, and learning about his mysterious past in India, it soon becomes clear to Alison that Alec died holding his secrets close to his chest. Alison is left craving the truth as she makes discoveries that threaten to tear her carefully crafted world apart. Wilson began approaching producers to see if the extraordinary story could indeed find its way to a wider audience than just family and close friends. Her grandmother, Alison Wilson, had written at great length about her experiences during the Second World War, her relationship with Alec, his death and her ultimate embrace of religion. 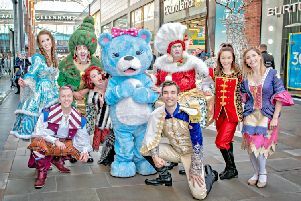 Theatre Royal Wakefield’s Cinderella cast are ready to go to the ball!